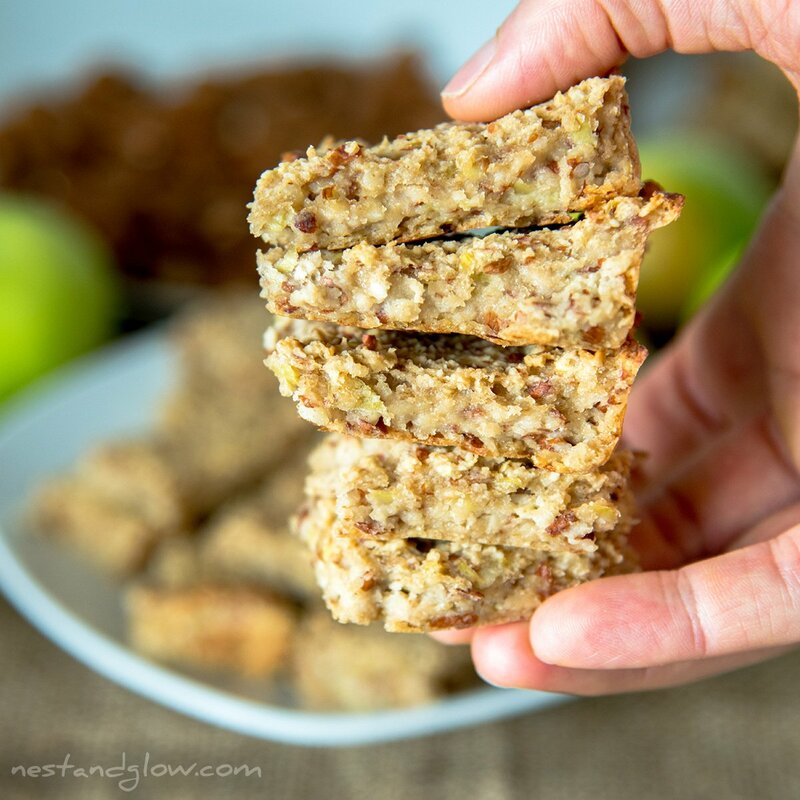 Healthy breakfast bar recipe that’s sweetened with fruit, high in protein, low calorie and made from just three ingredients. These oatmeal breakfast bars are chewy and filling. 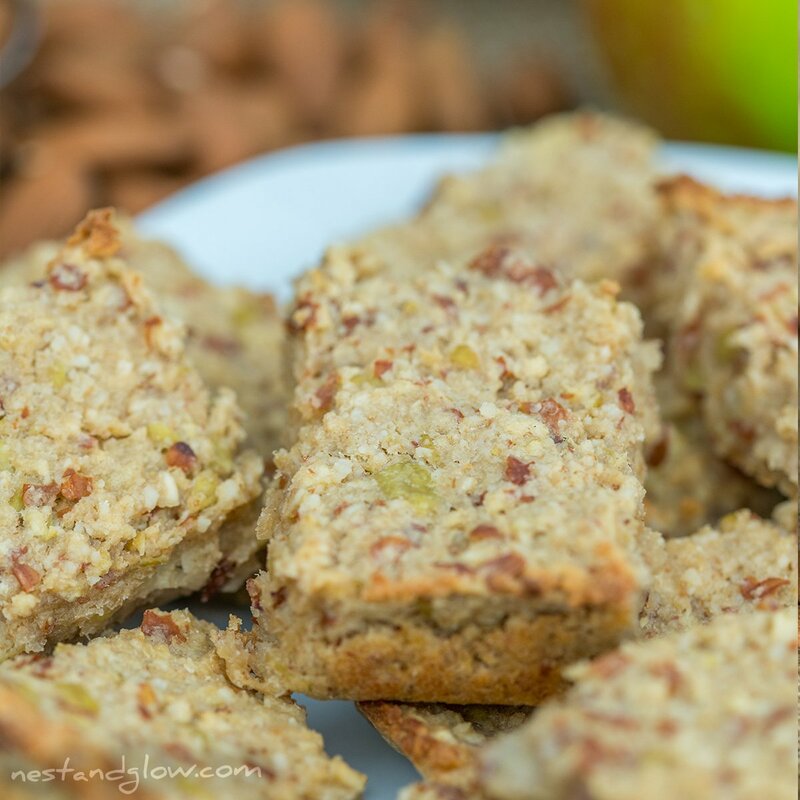 Easy to make and one batch makes for a filling on the go breakfast. Free of dairy, wheat, added sugar and oil. Suitable for vegan and whole food plant based diets. I’m using Bramley cooking apples for these breakfast bars mainly because I have a huge tree and so many to use in the autumn. You can use any apples that you like. I do like using cookers as it seems a shame to cook normal apples that can be eaten raw. 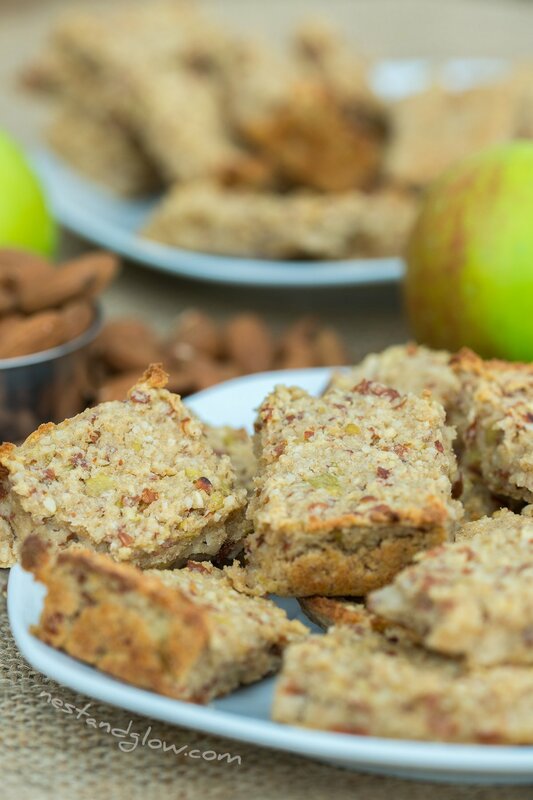 The apples aren’t peeled for this recipe as many of the vitamins and minerals are in the skin. Blending the whole apples with the skin gives a great texture, adds to the appearance with little skin flakes and maximises the nutrition. Play on YouTube or no music version. 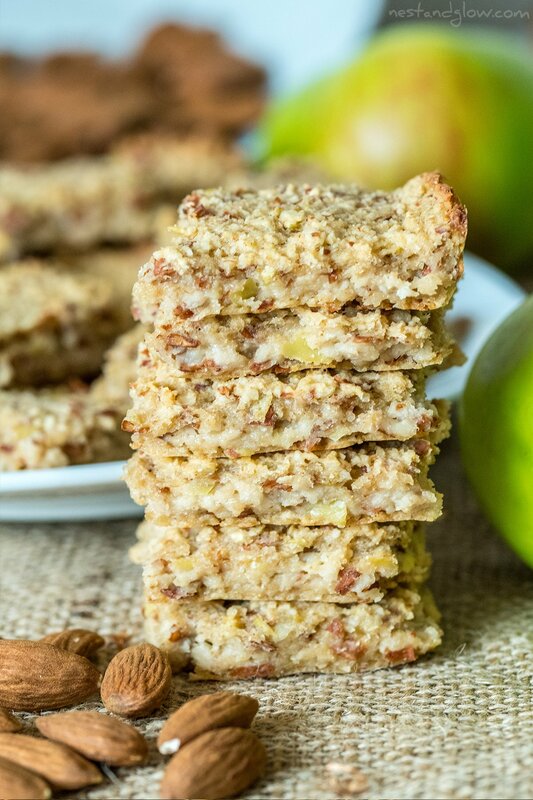 This mixture for the healthy breakfast bars is mostly apple and you want to have almost three times the volume of cubed apples as almonds. The ingredient lists for my recipes are always a bit dependant on the size of the produce. As my recipes are just natural whole foods it’s not so much a science as natural produce can vary so much in size, sweetness and flavour. 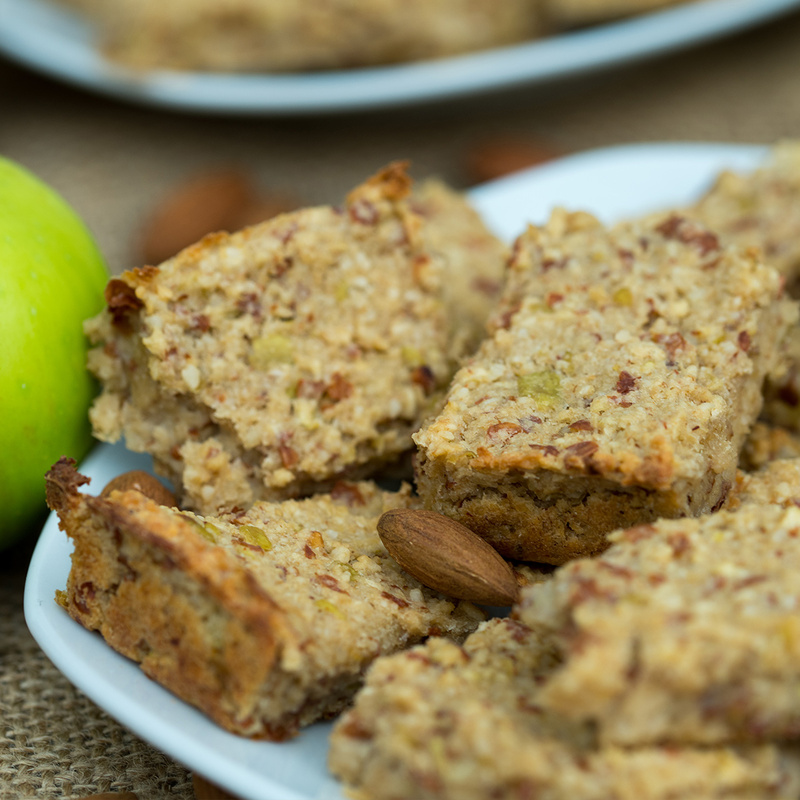 With this 3-ingredient breakfast bar recipe please do taste as you go. 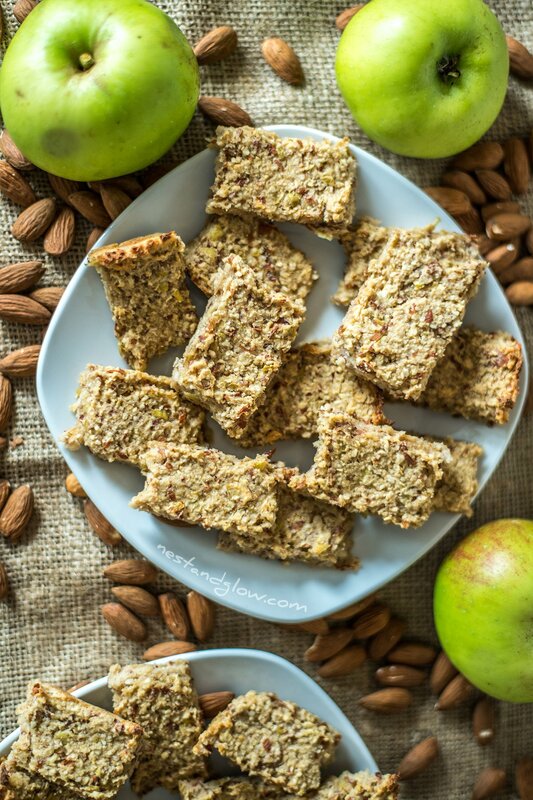 Almonds for these breakfast bars are soaked overnight in order to sprout/activate them and make it easier for the body to absorb the vitamins and minerals. If you don’t have time for an overnight soak then 1 hour is sufficient. Soaking nuts has been part of many cultures over the years and I really would recommend always soaking. The final almonds are dried in the oven but not roasted at a high temperature so much of the good oils and nutrition is still intact. 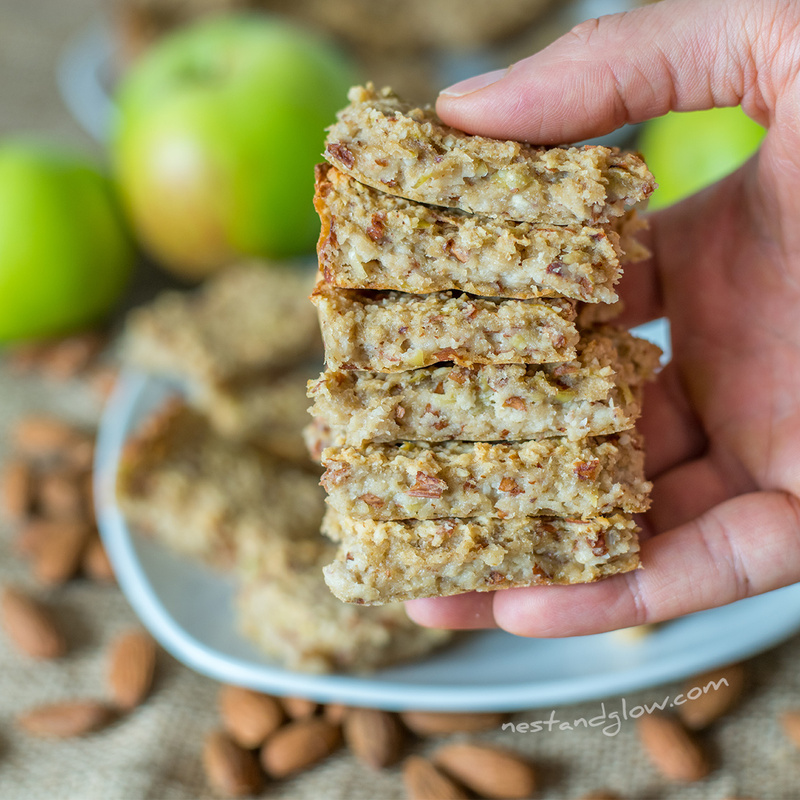 I’m using whole almonds for this and leaving the skins on for these healthy breakfast bars. Like apples, there’s lots of good stuff in the skin and don’t want to lose this. Plus the skins add to the appearance as it might be a bit boring without them. Blanched skinned almonds or almond flour can be used instead if you prefer, they are just not as nutritious. If you can then I would advise using Mediterranean almonds rather than Californian. This is as all Californian almonds have been pasteurised and are often lower quality. Also there are some issues with almond sustainability from Californian almonds. A food processor is best for this breakfast bar mixture as its slightly wet. Just two to three minutes is enough to combine all of the ingredients together. If you don’t have a food processor this can be done in a blender but you may need to do several batches. Greeseproof / parchment paper is used in this so that the breakfast bars can easily be removed from the pan. If you can then make sure to use unbleached paper. Some brands aren’t vegan so you may want to check if you are concerned about this. These breakfast bars are cooked at a low temperature to slowly get a light golden colour without acrylamides. There’s still lots of research to be done as to the effect of slightly burnt food and a possible cancer risk for humans but I do cook most things at a low temperature just to make sure. Whole rolled oats are used for this recipe rather than oatmeal or oat flour. I find it works best with crumbly oats as some whole oats can be tougher. Oats are naturally gluten-free but many are contaminated when growing or processing. Use gluen free oats if you are sensitive. Oats contain avenin otherwise known as oat gluten and while its similar to gluen 80% of people with issues with gluten are fine with gluten-free oats. I decided to make these into cube shapes just as it’s an efficient and quick way to bake a batch. They also work quite well as a cookie shape or in a longer breakfast bar. I wanted to keep this recipe nice and simple with just three ingredients. However don’t let that stop you from adding your own touches to this basic recipe to adapt it to your tastes. 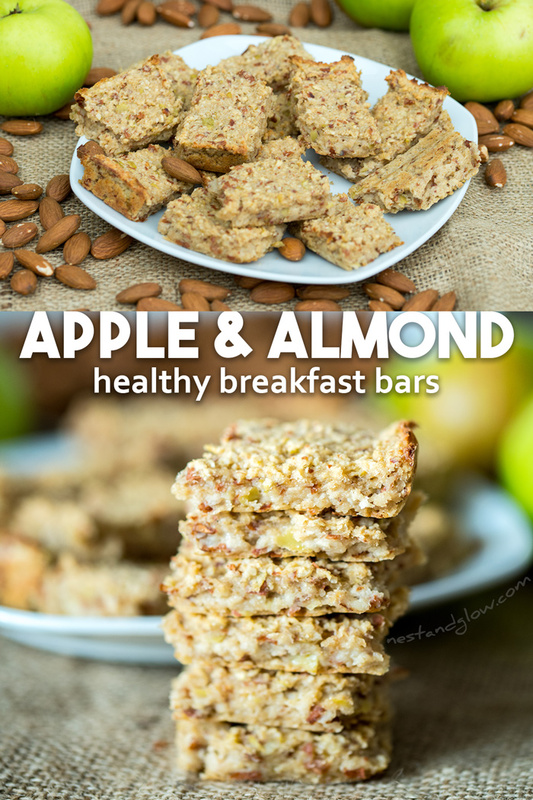 Have you adapted this healthy breakfast bar recipe? Do let me know in the comments below or tag me on Instagram @nestandglow. Soak the almonds overnight in water, in at least twice the volume of almonds. Core and cube all of the apples. Place everything into a food processor and blend for a few minutes until combined. Spread onto a pan about 12″ by 8″ lined with non-stick paper. Bake the breakfast bars for half an hour or until you can see the tops go golden. Take out of the oven and leave to firm up for 10 minutes. Remove from paper and separate and enjoy as they are or add any flourishes you like such as chopped banana or chocolate. Store breakfast bars in the fridge and enjoy within 5 days. This recipe is similar to my banana oatmeal cookies, however the most common question I got there was how to make it banana free. So this recipe is my adaptation to make it banana free – it’s a very different recipe in the end. If you like this recipe check out my banana coconut macaroons – just a few ingredients and dipped in rich dark chocolate. If you like these healthy breakfast bars three-ingredient recipe then be sure to check out my pumpkin seed chocolate 3 ingredient fudge recipe. All of my recipes are easy to make, just made from plants and bursting with good stuff. No relevant Nutrition details ??? Hello, there’s the calories listed in the recipe. However the full nutritional information is something I might do in the future. At the moment the recipe is formatted so it will import into my fitness pal or similar for that if you want to. Does that help? Yum sounds like some great additions, thanks for sharing! Thanks. I was looking for a healthy treat to have with my nightly tea. This is perfect! You’re welcome! This is a great healthy snack for the evening that is filling. Is there calories per square? I’m going to try tomorrow, always skip breakfast! I have pre roasted unsalted almonds can I use those or do I have to use raw almonds? i was wondering how long the bars would keep and if they are super crumby? Made the bars last week and we loved them, thanks for sharing! Just a quick question about storage – do you think they’ll last at all out of the fridge? My partner is flying for work so won’t be able to refrigerate for 12h-24h, so we’re looking for healthy breakfasts he can fly with. Hi there, I do go on the side of caution when saying to chill. I think these would be totally fine out the fridge for 12-24 hours. It’s a great on the road snack! Thanks for this ,I want to know if the Apple will be cooked before using or fresh ,raw apples?